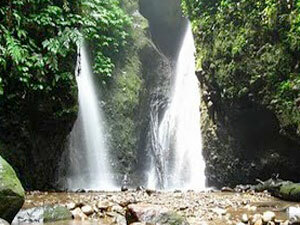 Seweru Waterfall is located in the slope of Mount Wilis in the height of 400 m from sea level. The source of the Waterfall is come from under the mount and arise above shady trees. This place is located about 25 km from Madiun city to the east preciselly in Kare village, Kare district. This tourism object is often visited by adolescents and the environmentalist because of its beautiful and astonishing panorama. Its air and environment around are very cool, while recreation they tested the agility and physical endurance with have sport. The beauty of Seweru Waterfall / Serondo / Selampir are accompanied with the forest tour scenery that increased the beauty of nature panorama. There is also the agro tourism object that increase the brightness of the environment; apples plantation, Citrus Fruit, flower garden and clove garden. The location is not far from Seweru waterfall location.